A/N our interviewee this week has transitioned from a successful 22 year career in the Royal Airforce to private enterprise….read on to discover how. Tell us a little about your career and how you ended up where you are today. I left school at 18 and joined the Royal Air Force a year later, having had a number of part-time jobs, bar work etc. I joined as an Admin Clerk and progressed through the ranks and HR roles for the next 22 years. I left the RAF 10 years ago and remained in HR. I worked in Edinburgh for the NHS for 9 years then moved to Stafford 2 years ago and now have an HR Manager position in a computer company. What makes someone good in your chosen field? I think you need to be compassionate and empathetic where necessary but also be firm and determined when required. Some of the jobs that HR Managers have to do are not always pleasant, such as dismissals and disciplinaries, but employment law is fascinating and the employee support side of HR can be very rewarding. You also have to have exceptional attention to detail! What mediums/areas do you mostly operate in? I operate mostly in employee and business support. What can be challenging about your profession? Dealing with people always has its challenges, particularly when dealing with disciplinary matters or when dealing with conflict. What do you most like about your profession? I love the challenge of dealing with different people and to be able to see change taking place to benefit employees. What has been your most embarrassing professional moment? It wasn’t embarrassing for me, but it did end up being embarrassing for the officer who took me on! I was 8 months pregnant and had been asked to run a Court-Martial on the base I was on. One officer had the temerity to ask me if I could “cope”…you can imagine my response and he ended up with egg on his face – plus the Court-Martial was very successful! What has been your most nerve-wracking professional moment? Going for my first job after leaving the RAF…I hadn’t had a job interview for 22 years…I ended up getting the job and staying in it for a couple of years, despite my nerves at interview. What one piece of advice would you give someone starting out their careers; especially in your field? Make sure you know your employment law, if not, then check, check and check again. HR administration takes a lot of time, effort and checking, often people’s careers are at stake. Always remember that you are dealing with real people. Andrea Fraser is HR Manager dealing with all aspects of HR, including disciplinary, employment law, policy and process implementation. The best speaker I have EVER heard! Over the course of my career, I have met a great many people and listened to a zillion public speakers ranging from royalty and heads of state to PTA Chairs and multibillionaires. Tonight, I heard the best speaker ever! 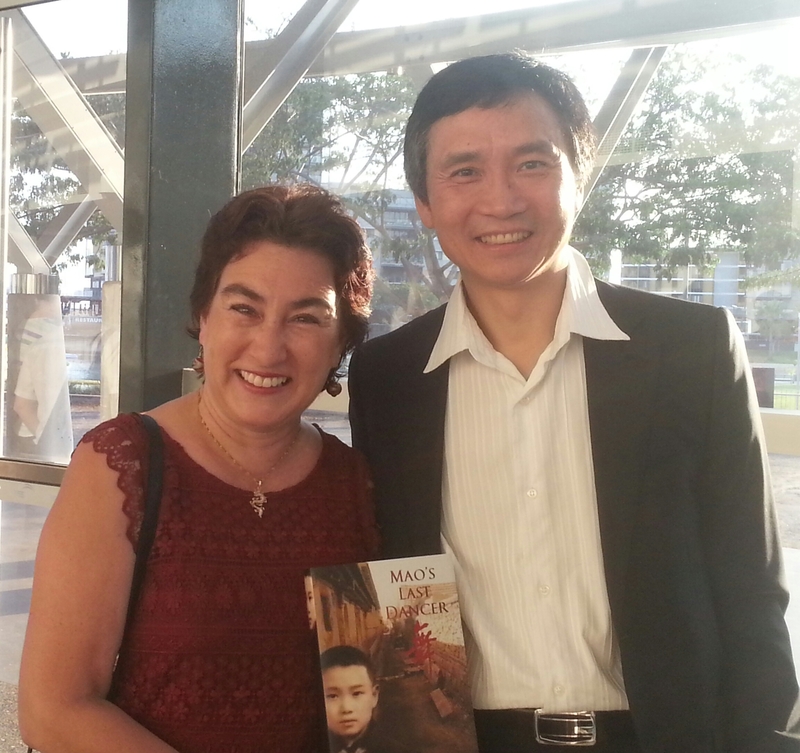 This evening I was very privileged to meet Li Cunxin. Many of you reading this post have probably seen Mao’s Last Dancer and may have even read the book which is his autobiography. I have seen the movie and read the book, but despite all this, nothing could prepare me for the man himself. He’s AWESOME! Personable, humble and approachable. Why do I say he’s the best? He’s got the X-factor – combined with his passion, his genuineness and his absolute authenticity which came through every inch of the way. He did not need notes and he owned the stage, holding the audience in the palm of his hand for the entire one hour presentation. I have to admit I shed a couple of tears as he recounted his reflections on going to bed hungry and the sacrifices his parents made for their children. Li’s message is a simple one; have courage, be tenacious and anything you dream is achievable. He did not dream of being a ballet dancer, but he did dream of escaping from poverty and starvation. Ballet was an opportunity, grabbed with both hands. Even when he could have rested on his laurels, he didn’t and went on to achieve more and more because he believes in seizing the day and living life to the full, he thrives on a challenge to be the best he can be. Thank you to the NT Government and sponsors of October Business Month for bringing us this wonderful speaker! I loved his message and whilst I’m fortunate to always have had food on my plate and never go to bed hungry, I do believe we should all live life to the fullest, believe in ourself and maximise all opportunities that come our way. 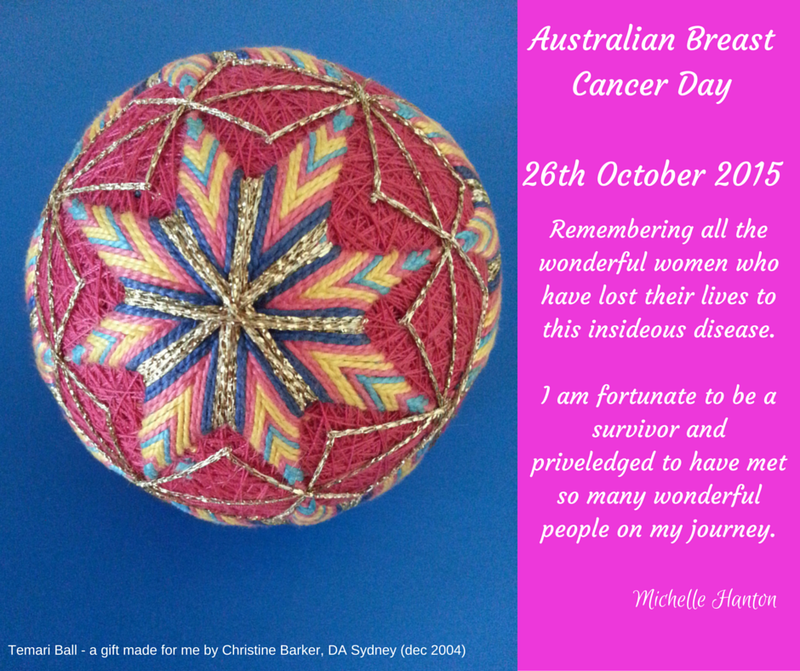 We should also always give thanks for being fortunate enough to live in Australia. Dare to dream, it can become your reality! I don’t know if you’ve noticed, but there seems to be a proliferation of individuals and companies professing to offer solutions to any problems that we face in our lives. There is also a myriad of life coaches, professional development experts and solution sellers, going under a gazillion different titles. Some use a fancy spin, some use a high-pressure sales techniques, while others take a more strategic approach using a formula. I’ve been involved with coaching and mentoring, in one form or another, for many years now. Why? I like helping people. I always have. It’s my strength and also my weakness, but I genuinely enjoy what I do, even if there are sometimes challenges that throw me a curve ball. There is no doubt that the personal development market and life coach business is a booming industry. I want to be very clear and say that there are some truly excellent people out there doing wonderful work, and I’m fortunate to count many of them amongst my associates. However, what I do find very worrying is that there is also a slew of offerings, from some very slick marketing operators, but they do not have the life experience to back up their claims. They fail to understand the responsibility that comes with working with individuals. By responsibility, I mean things like the need to understand that we are dealing with human emotions. There may be deep-rooted issues, which are blocking personal success, that bubble to the surface. As a mentor or coach, it is vital to recognise this and deal with it appropriately. This includes being responsible enough to recognise when you need to admit that you are not actually the right person who can help. Often, you can facilitate an introduction to another professional you know and trust. Not so long ago a newly trained coach, who had very little life experience, came to ask me to help with client referrals. I asked my usual due diligence questions and was appalled when she confidently told me that she had no backup supports in place, for any issues that might unpack beyond her experience. Her reasoning was she had all the skills necessary and was so confident she would never need support. Whoever had trained her had certainly done a great job to confidence build and I applaud that. However, this raised a big red flag for me as there was no sense of responsibility. Woah! It is just not possible, for anyone to know everything. Even highly qualified and vastly experienced coaches, mentors and psychologists that I have worked with over the last 20 years all have their professional support structures. 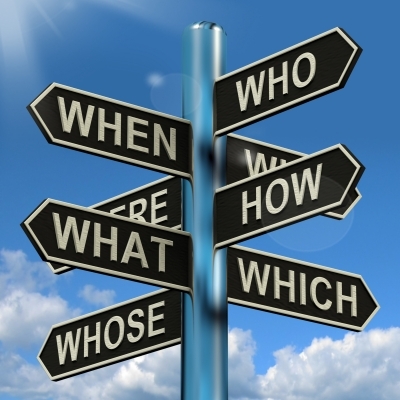 I position myself as a bespoke business strategist and sometimes this includes a level of coaching and mentoring, but I certainly do not have all the answers. Blowing my own trumpet, I know I satisfy my clients because they tell me so. They tell me I’m really in tune with their needs. I feel it is more accurate to say I’m actually in tune with myself. I take my responsibility very seriously, with my family, my students and my clients. This means knowing when I am struggling, asking for help and turning away or terminating client relationships when I know I am not the right person for them. 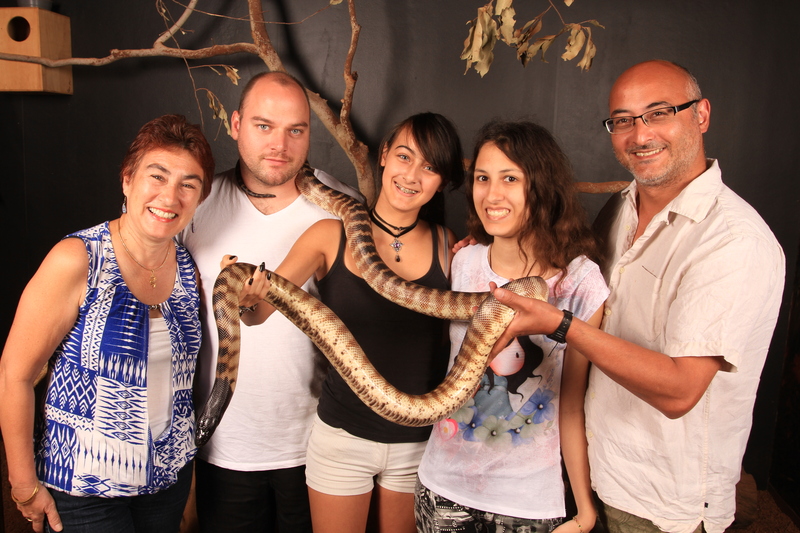 Definitely out of my comfort zone with the snake, but a family photo was required. Being responsible, also entails responsibility for self: consciously making time in your schedule, for a holistic balance in all life areas. Time to nurture relationships, time for family and time for friendships. Earlier this week, I took the day off to go with my adult family to the Wildlife Park, we had a great day connecting with each other and with nature. Moments like this are priceless as time is the one commodity that cannot be recaptured. If we cannot exercise self-responsibility, then how can we, as coaches and mentors, effectively guide others in life areas? In Australia, July 1st marks the start of a new financial year. For most businesses, regardless of size, the precursor to this is a period of frenzied activity. Wrapping up the old financial year and preparing for the new: creating new strategies, setting and taking new directions, evaluating the past year’s performance success factors and deciding where to focus energies and resources next. It’s a part of the year-end process that I enjoy because it is a wonderful period of reflection where the results are normally visible and measurable. I derive great enjoyment from my involvement with my clients and personal students, both as a business woman, a teacher and as a bespoke coach. This year, the 1st of July also marked the date I arrived back in Australia after almost a year spent working in Europe. 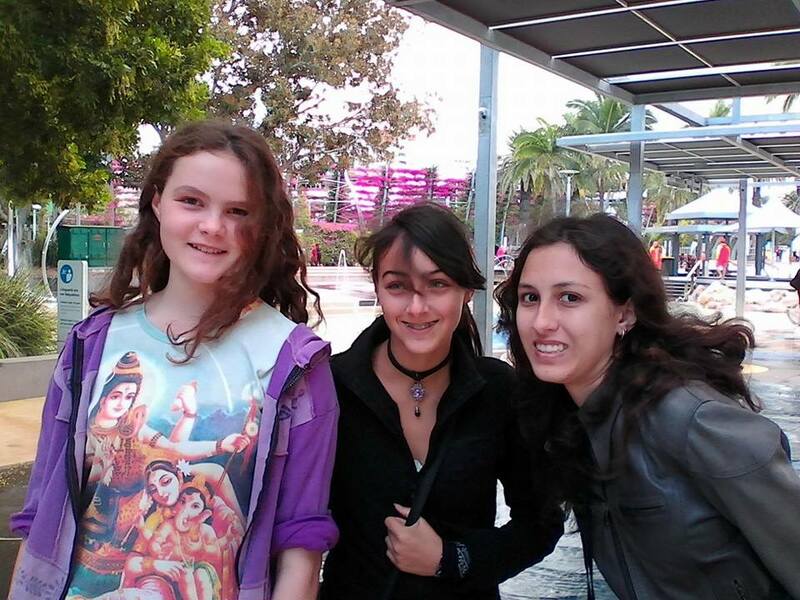 Instead of travelling solo, as I so often do, I was accompanied by my 13-year-old niece, who I was bringing on her very first visit to Australia. 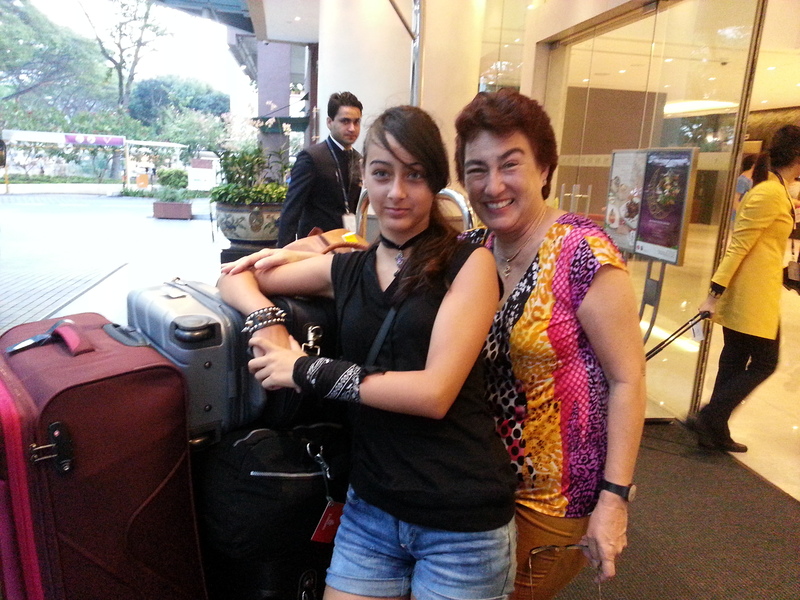 My son, who’s been spending the last couple of months in Europe was also accompanying me. We took time out to make a short stopover in Singapore and introduce Alexa to a little part of this island that hold so many memories for all the Van Buerle family. My very long journey back also allowed me plenty of thinking time. Time to reflect on what direction to pursue next in life. Teaching, guiding and coaching is such a rewarding, enriching, privilege on so many different levels, not least of which, is the sense of making a significant contribution to both the personal and business growth of clients and students alike. The wonderful thing about introducing new experiences, concepts, thoughts and ideas is that I can help people develop and grow so that they can achieve their goals regardless of whether on a personal or business level. Alexa’s experiences on this trip to Australia will be with her for the rest of her life. She will be able to use them as building blocks for her future. It is not too dissimilar to the experiences I offer my clients in the sense that it is building capacity for growth. There is a misconception that a coach/mentor is a guru-like figure who spends their time telling lesser mortals what they should be doing when, in fact, nothing is further from the truth. It is about greater understanding, empathy, trust, respect, confidentiality, mutual liking and being on the same wavelength. It’s an egalitarian relationship of strong integrity and authenticity. I often develop a special relationship with those I work with and in some cases it even becomes an ongoing friendship. My role as a coach/mentor has developed from working with diverse cultures and organizations. People began to consult me on matters that they were ‘stuck on’, life and business areas that they wanted better results from, identifying ways to move forward, strategies to move in new directions. My business achievements, life experience, cultural range and above all, my passion for progressive, empowering growth, seemed to resonate with individuals from widely varying backgrounds, age groups and levels of experience. They all have had the common objective of wanting to effect positive, meaningful change. You could say that this kind of work crept up on me. I’ve found that there is nothing more fulfilling than working, either as a coach, mentor or teacher, to facilitate the achievement of powerful outcomes. With the wonders of technology, it does not seem to matter where I am geographically. My only real limitation of being able to help more people is time. Whilst working full-time I was only able take on a very small number of personal clients which was why the year in Europe was so wonderful, as it opened up considerably more free time in my work diary. On my long journey from Barcelona to Darwin, I had time to think carefully and decide that I am making the time. I do not want to be bogged down in a corporate job. Sure a high salary is nice, but at the end of the day it is not fulfilling for me. Instead, I have decided that I am making the time to do what I really enjoy and that is being able to take on a few more personal clients through our Dragon Sisters global network. I am very happy with this decision and excited to think about the new goals, the new solutions and the new individuals that I’ll be able to work with over the next twelve months. So, to all those who’ve been asking whether I will be available this year, the answer is yes. If you or someone you know is struggling to find solutions to achieve business ambitions or just generally wants to get life on track, I’d be happy to have a confidential, exploratory ‘chat’ about how I may be able to help. When I was a child a year seemed like an awfully long time. It was an unbearable wait till Christmas rolled around each year. At boarding school the terms seemed to drag on interminably whilst I counted down the days until school holidays. I think that’s pretty normal for kids, approaching life with gusto, keen to move on to whatever comes next. I remember wishing that I was 16, then I wanted to be 18 and before I knew it I was celebrating my 21st birthday. After that the years fled by at the speed of light. The older I get the faster they whizz past. As I’ve grown older I’ve become much more aware of how important it is to cherish the precious moments in life. It’s not about the places. It’s about the moment we are in. We don’t have a rewind button so we absolutely have to enjoy experiences the first time round. I think many of us struggle with remembering to live in the moment, after all how often do you find yourself walking or driving along thinking about what you will cook for dinner tonight, or about a meeting you have to attend, a place you want to go next or something else in either the past or the future? When we do these kinds of things (and hey, I’m as guilty as the next o f this), what we are actually doing is robbing ourselves of time to enjoy and appreciate what surrounds us at that very moment and place in time. I know that when I am consciously in that exact moment, I notice so much more. My powers of observation are much sharper and this is a good thing. I am focussing on what is right there in front of me. It might be the beauty of some little detail on a building I pass, a wonder of nature, or a subtle unspoken key that a family member, friend or colleague is transmitting. If we are too busy looking forward to a future point in time, we are cheating ourselves of experiencing life to the fullest. Some of the happiest people I know are not those who have everything but rather those who truly appreciate and take the time to live in the present moment. It’s not so easy to do but I highly recommend trying to slow down, to appreciate the here and now rather than dwelling in the past thinking about what we could have or should have done. It’s past and can’t be undone. Don’t dwell too much on the future either because nothing is certain. Instead, enjoy today – as the old cliche says ‘that’s why it’s called the present’. PS I’ve often spoken about the importance of living in the moment but I’ve never put it down in a blog but I was inspired recently by Marie Griffith with More painful th..to write it all down.